How do I add the form in facebook now that there is no longer a FBML application? Hi Thanks for the info but when I copy and paste the code from jotform and click submit I get the message "Navigation to this page has been cancelled" Any suggestions? Have you tried the solution offered by Daniel? 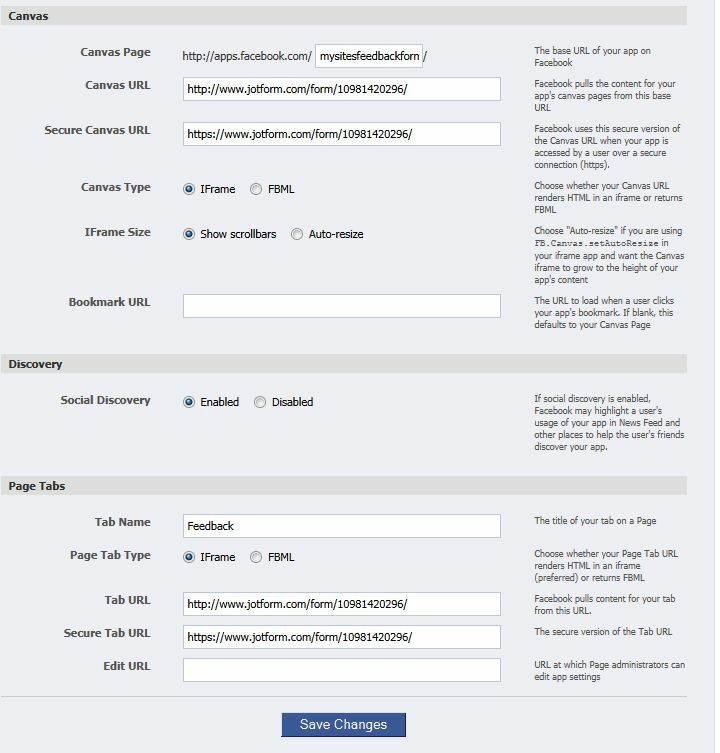 This user guide - http://www.jotform.com/help/82-Add-Form-to-Facebook-using-an-iframe-application - has worked well for users who correctly followed the steps outlined. Take a look at this Example Page made possible by creating an iframe application dedicated for the contact form. Yes I did also try that and keep getting 404 page not found so they had suggested the tab press application. I did follow the steps and was able to successfully create and add the application but then when you try to use it, the error pops up. The Error 404 Page not found message tells you that the webpage, document or file requested was not found (in this case, the form page). Please double check if the URL of the JotForm form in your embed code is correct. For more information about Error 404, please click here. Hope this information will be helpful. Please let us know if we cna be of further assistance. Thank you for using JotForm! Like I mentioned in my previous post, that particular solution has worked well for a lot of our users. It would be better if you stick to that so we can help you figure out the cause of problem and eventually fix it. Now get back to the user guide, and do the remaining steps. Let us know if you need any clarifications. Sorry but we have to delete your latest post since it was unintelligible. Kindly post it again so that we can assist you further. I tried gong through the whole process again and got the message. "Content was blocked because it was not siigned by a valid security certificate. I clicked to view block page and then got the 404 error. I am so frustrated. Could it be a security setting? I went through my facebook account and everything seems fine. Would it be possible to show us a screenshot of your application's Facebook Integrations ettings? Also, can you please give me the link to your Facebook Page? I tried every single scenario on how to replicate the error you are getting but I always fail. I think it would be best if we could see your FB page to be able to find what's causing the problem. Please post your reply again as your previous posting came out as a blank response. We would like to hear from you soon. Thank you.